As a Boy Mom, I thought that I should share my experience and tips that focus on caring for boys shoes. After all, there are multiple issues that you are likely to encounter when it comes to their shoes! 1. Buy good quality shoes. Shoes are one area where I won't skimp. My boys play hard and need good support. Plus, good quality shoes typically seem to hold up better and longer. I really should list this tip twice because a good shoe deodorizer pays dividends at our house. In the heart of Texas, it's hot and humid during most of the year. The combination of the Texas heat and boys who play hard is a recipe for smelly shoes. We keep shoe deodorizer in our mud room so that our children take their shoes off near the door and we are able to quickly spray them down. We use the Arm & Hammer brand Shoe Refresher Spray. It helps with odor control on contact which is a life saver for us! The 360-degree actuator sprays in any direction which is extra nice when I want to minimize touching their shoes. (It happens!) This product is inexpensive too. You may be able to find it at local stores, but if not, here it is on Walmart's website. In addition to a defensive strategy, we also go on offense when it comes to odor. We use Arm & Hammer Invisible Foot Powder Spray and the Invisible Body Powder Spray. These are the only brands that I have come across that haven't left a white mess on shoes, clothing, or feet. They use Arm & Hammer Baking Soda and odor neutralizing ingredients to absorb moisture and sweat. My boys play hard, so good hygiene is extra important. If my boys have irritation on their feet, it's easy for me to notice because of the odd ways that they will walk (usually damaging their shoes in the process.) I really like the Arm & Hammer Foot Care Moisturizer with Gentle Exfoliators because the product works really well and they enjoy using it. The little tube has a built in applicator that makes it easy to use. You may have noticed that we personally use a lot of products with Arm & Hammer Baking Soda. I really like that their products are simple and work so well! 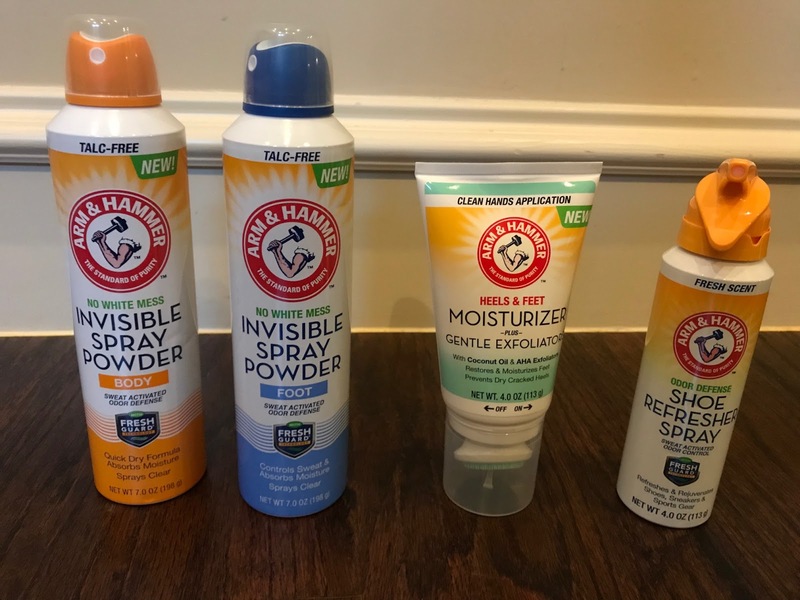 As a Boy Mom, I like to focus on things that "just work" for my boys, so Arm & Hammer fits our lifestyle.